Socket Mobile DuraScan D700 Bluetooth Barcode Scanners - Cordless/Wireless Bluetooth scanning for iOS, Android and Windows mobile smart devices. D700 DuraScan is a 1D Bluetooth® barcode scanner - Built rough and tough for applications in warehouses, outdoor distribution and industrial manufacturing conditions, this Bluetooth® wireless technology scanner’s seal withstands dust, water splashes, and germs. However, its softer side still remains light and comfortable in working hands, as well as elegant for showcasing and use in boutique environments for high-end clientele. With a dual personality, the DuraScan can be used for your business’ behind the scenes needs (warehouses, stocking, shipping, etc.) as well as the front end of your business, to impress customers with such sleek style and dependable data capture technology sitting in the palm of your hand. MFi certified by Apple® for iOS devices (iPad®, iPhone®, iTouch®) and compatible with Android and Windows® smartphones and tablets. 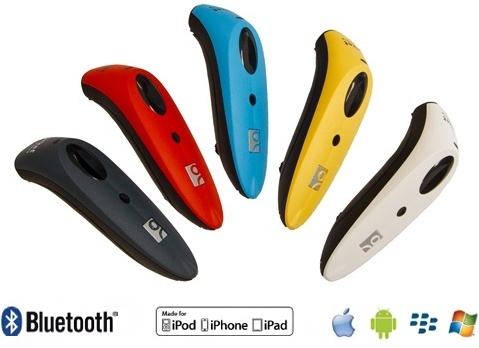 The DuraScan D700 1D Bluetooth barcode scanner is strong, durable, elegant and ergonomically designed. Its antimicrobial material and IP54-rated casing withstands drops, dirt, and water splashes. The D700 DuraScan is a 1D Bluetooth® barcode scanner that is built for the most commonly used barcodes. Strong and durable for warehouses, outdoor distribution and industrial manufacturing, the scanner’s outer casing withstands multiple drops and tumbles for those tougher work environments. The D700’s casing has an IP54 rating, withstanding dirt and water splashes to keep up with the job’s demands. Even germs have trouble sticking to its antimicrobial material, making it a perfect pairing for the healthcare industry. But, don’t let its rough and tough exterior fool you, the D700 has a softer side, a sleeker side. Remaining ergonomic and elegant for those more sophisticated environments and clientele, the D700 can put on a show or be part of the show, sitting on the sidelines of a fancy shop or taking part in an exposition. Workhorse, nursemaid, wingman, showman – the D700’s versatility is best described as a chameleon. Its adaptable assets are diverse so it can suit almost any industry or working condition. Reading Distance: 1D codes 5.7 to 50.8 cm (2.25 to 20 in) Resolution / Depends on barcode size, symbology, label media, Narrow and Wide width ratio scan angle.